An easy-to-use and free tool for batch resizing of JPG pictures and photos. 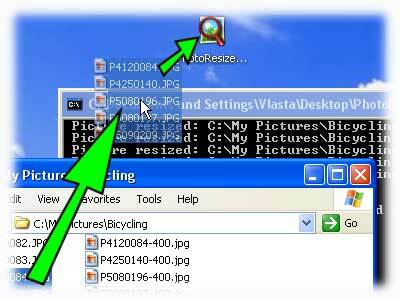 Drag and drop JPG files or folders with JPG files on the application icon. The tool will resize JPG images and save them next to the originals. Names of the new pictures will be based on the original names, with a suffix indicating their size. For example, the resized version of MyPhoto.jpg will be called MyPhoto-400.jpg, where the number 400 indicates the size of the picture. The size of output pictures is controlled by the name of the application. To rename it, click on the icon to select it and do one of these things: press F2 key, click in the text under the icon, or right-click the icon and select Rename command in the menu.